Beyond aesthetics, Michael Feinman’s flight photography offers a glimpse at the future of drone use. After 12 hours, Michael Feinman finally arrived in a remote location in Puerto Rico. It was February, and while riding along the bumpy roads to get to his destination, he could see how badly Hurricane Maria had impacted the island, even five months after the storm. Blue tarps and “FEMA” written in giant, red letters in spray paint covered many of the homes, while the two-lane roads were littered with potholes and broken traffic lights. He was there on a special assignment with UCF’s Department of Security and Emergency Management to assess damage to Arecibo Observatory, which is now managed by UCF. For two days, he worked to capture images using drone photography of the 118 acres that make up the observatory. Back at UCF, Feinman also completes special security management assignments using drone photography. The sophomore integrated business major has been able to create aerial mapping of specific areas of campus to improve security measures, all while never leaving the ground. Originally from Philadelphia, Pennsylvania, Feinman often played with remote control toys, like helicopters and boats, as a kid. He grew out of the hobby until high school when he saw one of his advisors using a drone. Despite having no practice with photography, Feinman wanted to use to technology to capture photos. “Everyone takes pictures with their phone, everyone takes pictures with cameras, but when I saw what it looked like from above — seeing a new perspective on what you could do with a drone — it was just pretty amazing,” Feinman says. Although he really couldn’t afford it at the time, Feinman bought a drone and acquired a license with the Federal Aviation Administration. Eventually he covered his costs by doing photography through his company, New Perspective Imaging, for real estate companies within the greater Philadelphia area. “You really have to have an eye for it because, even with people using traditional cameras and do[ing] traditional ground photography, it’s a different ball game when you’re looking at something from above,” Feinman says. Part of the reason Feinman decided to come to UCF was the great weather and beauty of the campus. 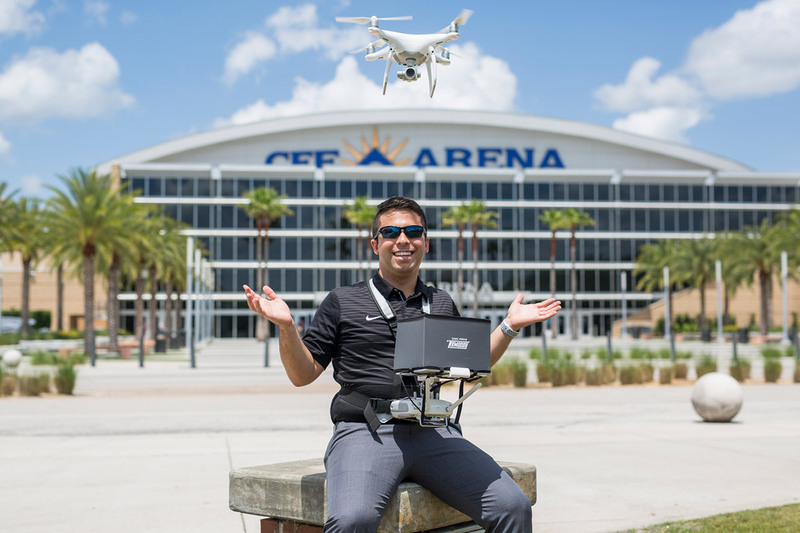 Wanting to capture those elements with his drone photography, he reached out to UCF’s Department of Security and Emergency Management before arriving on campus to make sure he would follow proper rules and regulations. Feinman was hired after Hurricane Irma impacted campus and helped developed procedures for drone-related safety management practices for future storms. By February, Feinman was given the unique opportunity to fly to Puerto Rico with Souza and assess the damage caused by Hurricane Maria at the Arecibo Observatory. Typically drones are not allowed to be flown in the area because they interfere with technology on the facility, but this time they proved to be helpful. Through the imaging captured by Feinman, the team was able to locate many fallen trees and debris-covered roofs. Ultimately the only building damaged was a trailer used for breaks by the observatory’s workers, which would need to be completely rebuilt. Feinman isn’t entirely sure what he wants to do after graduation, but he aims to remain open to any opportunities, particularly ones that utilize drones. “Drone technology’s emerging every single day,” Feinman says. “There are a lot of uses for drones in the public safety area, such as with beach patrols where they can drop a life preserver to save someone’s life before lifeguards get to them, [so] I’m really excited about what’s happening with drones,” Feinman says. One area of safety Feinman has helped out with on campus was monitoring the burn control in April. Working with the Department of Landscape and Natural Resources, Feinman created aerial mappings of the proposed burn areas within the Arboretum before and after the process. During the burn, he used his drone to ensure the fire stayed within the designated areas. With three years of experience and now flying a high-tech DJI Phantom 4 Professional, Feinman has learned enough about flying drones to pass on a few pieces of advice to beginners. Feinman first emphasizes the importance of getting a license, whether you wish to fly as a hobby or for commercial purposes, and becoming familiar with the drone operation laws in the area you intend to fly. As for purchasing your first drone, less is more. While more expensive drones often have GPS lock and sensors to avoid crashing, these features have stopped working for Feinman numerous times when he’s flown a drone. In terms of developing talent with drone flight or photography, you can’t cheat practice.